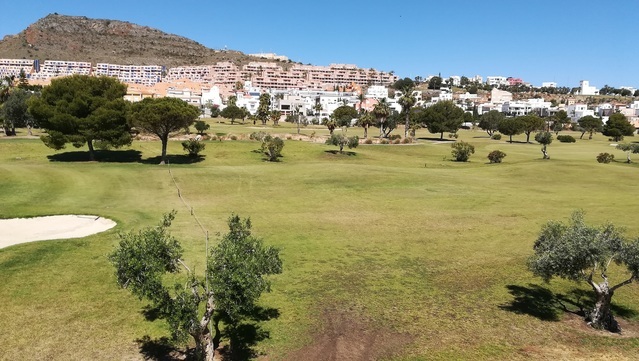 Lovely apartment with great sea and golf course views for sale in Marina de la Torre, Mojácar, Costa de Almería, Andalusia. Property has a built area of 70.05m² + covered terrace of 14m² and is part of a residential complex with 2 swimming pools. First floor apartment with direct ( no steps) access from the community gardens and comprises: entrance hall, 3 bedrooms , full family bathroom, shower-room, fully fitted and equipped kitchen with separate laundry room and lounge -diner with patio door leading out to covered terrace enjoying lovely views over swimming pool, the sea and the golf course. Two of the bedrooms with built-in wardrobes, centralised aire conditioning ( hot & cold) and price includes furniture and white goods.